Spanish restaurant Camino are providing a welcome antidote to your winter blues with their new Weekend Feasts. Available from 12pm onwards on weekends at Camino Bankside, and Saturdays at Camino Shoreditch, Weekend Feasts are perfect for sharing. 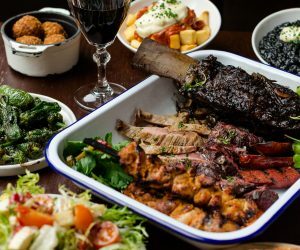 Featuring an incredible and hearty meat feast of typical Spanish grill for the table, plus a side each to choose from, it’s also great value at just £20 per person. In addition, there are some brand new seasonal specials coming up at all sites for February and March, including Pan roasted venison loin, with a spinach and idiazabal cheese cake and Oloroso sauce and Chargrilled calçots with Romesco sauce.